The winner, crossing the finish line at 19mph. Here it is mid week, the weather is miserable and just about now it’s great to be able to look back to the weekend and remember something special. 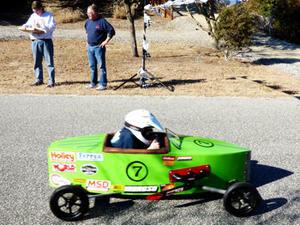 . . like the Soap Box Derby that Cub Scout Pack 117 ran in Southern Shores on Sunday. It was a picture perfect day as the boys gathered at the top of East Dogwood to race to the bottom of the hill. The car designs ran the gamut from wooden seats on four wheels to sleek, aerodynamic creations complete with a latched door. A double elimination contest, the competition was fierce with cars racing down the road, neck and neck to the finish line. In the end, green #7 ruled the day with the police at the bottom of the hill clocking the racer at 19mph on their radar gun. First run in 1934 in Akron, OH, the Soap Box Derby had been a part of many Cub Scout packs for years. With parents in attendance, neighbors popping out of their homes to watch and a few passersby, it was a great day to celebrate community, scouting and sunshine on the Outer Banks.